Rep. Michael D’Agostino defending the contract. Watching from well of the House were Mary Caruso and her daughter, Alex, who uses a wheelchair. 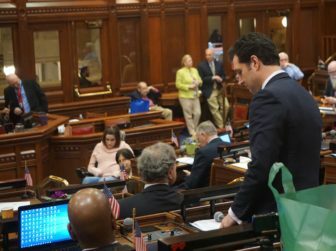 The General Assembly voted Wednesday to approve a contract that will raise wages, provide workers’ compensation and increase holiday pay for thousands of private-sector, personal-care assistants who are directly employed by their elderly and disabled clients, but paid through state and federal programs. “Yeah, baby!” came a shout from the House gallery after the House voted 127 to 16 for final passage of the contract negotiated on behalf of the workers by the New England Health Care Employees Union, District 1199, with a PCA Workforce Council created under legislation passed in 2012 with the support of Gov. Dannel P. Malloy. The Senate vote was 32-0. Hourly wages for most assistants would increase next month from $13.53 to $14.75, then continue to increase in increments until reaching $16.25 on July 1, 2020. They would become eligible for worker’s compensation coverage, while they still lack health care and retirement benefits under the deal. Many clients opposed passage of the 2012 law, saying they feared they would lose the right to choose their personal care assistants, often an intimate part of their lives. 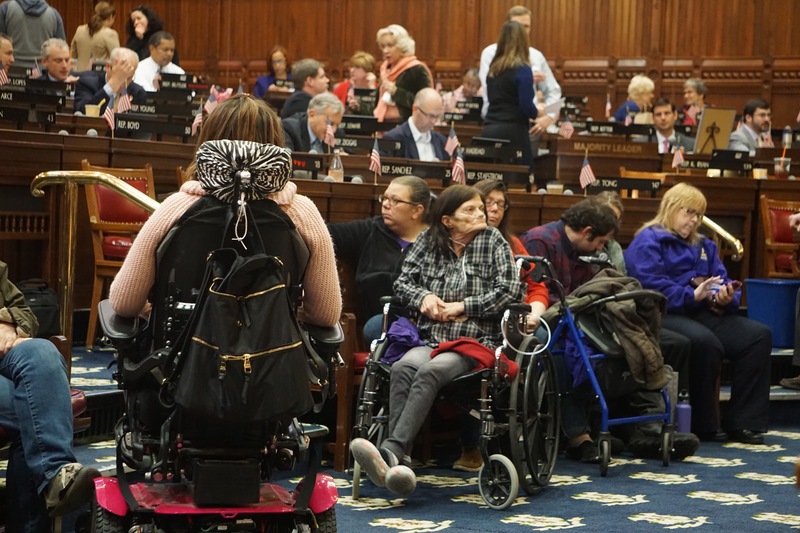 Those fears were unfounded, and several clients, some in wheelchairs, came to the House chamber to demonstrate their support for the new contract. “That tells us we did the right thing,” said Rep. Michael D’Agostino, D-Hamden, who presented the contract to the House. All 16 lawmakers who voted against approval were House Republicans, including some who say they objected less to the wage levels in the new contract than the state’s insertion of a union into the relationship between the elderly and disabled clients and the attendants who care for them. Clients of personal care assistants visited the House during the debate. David Pickus, the president of 1199, an SEIU affiliate, said the record contradicts Sampson’s assertion that the union involvement was unnecessary. “That’s an old saw that doesn’t cut,” he said. Sampson said the measure is a boon to SEIU, producing union dues. Pickus said the union collects dues on the contract of 2 1/4 percent of wages, up to a monthly maximum of $79, from the 8,500 workers covered by the contract. Rep. Melissa H. Ziobron of East Haddam, the ranking House Republican on the Appropriations Committee, questioned the process by which the raises were negotiated and whether the state could afford them. The raises are worth $11.9 million next year and $20.2 million in the final year of the contract. With increased federal reimbursements, the cost to the state is less, ranging from $7.1 million next year to $11.3 million the final year. Ziobron ultimately voted to approve the contract. Mary Caruso, the mother of two young adults who employ personal care assistants to help them cope with Friedreich’s ataxia, a progressive neurological condition, watched the debate from the front of the House chamber with her daughter, Alex, who uses a wheelchair. Caruso, a member of the PCA Workforce Council, said she supported the raises, which she says will help produce a stable workforce for the disabled. Debra Hoyt, the president of the CT Association for Healthcare at Home, warned that the non-profit agencies her group represents have not seen Medicaid reimbursement rates go up for 10 years, meaning they cannot afford to match the raises now going to the unionized attendants covered by the new contract.